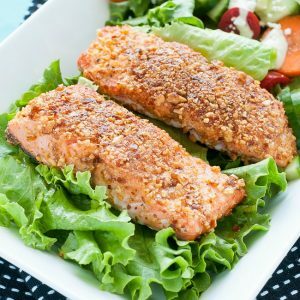 This tasty Sriracha Almond Crusted Salmon recipe is quick, easy, and loaded with nutrients! You're gonna love this healthy protein-packed dish! Add almonds to a bag and crush into coarse crumbs using any tool of your choosing. I used a mason jar but a wine bottle or glass olive oil bottle also works! Pat salmon dry and sprinkle with 1/8 tsp of salt. Brush with egg white and top with crushed Sriracha almonds. Press to coat. Since we're searing these skin-on [it helps keep the tender easily-flaked fish together] only one side of the salmon will need a coating. Next place a TBSP or two of oil in a pan or skillet and bring to medium-high heat. Sear each side for a minute or two, adding more oil if needed, then transfer to the oven to bake. With a spatula, gently move the salmon to a foil lined baking sheet, skin side down, and bake for approximately 5-10 minutes, depending on the thickness of your fillets, until the center is fully cooked and opaque. If you're using a cast-iron or oven-safe skillet, pop that bad boy with the fish directly in the oven. The result is a crisp, flavorful crust on the outside with a tender flaky inside. Serve piping hot and devour immediately. FEELING SAUCY? Serve with a drizzle of Sriracha chili sauce or whip up a ramekin of Sriracha yogurt sauce by whisking together the sauce ingredients above. For a paleo-friendly sauce, replace yogurt with mayo.